This cute little Mr & Mrs double frame makes a perfect mini wedding or anniversary gift. 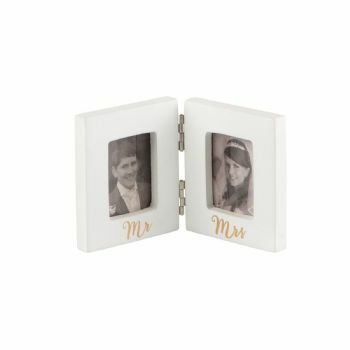 Hinged together at the sides, the frames can be closed over or opened to be displayed anywhere in the home. On the first frame it reads "Mr" and on the second frame "Mrs" in a lovely gold italic font.